The Ranger is a compact, handheld, digital instrument which detects alpha, beta, gamma, and x-rays. The unit features built-in efficiencies for common isotopes to estimate activity in Bq and DPM. Noteworthy features include a backlit digital display, a red count light, and a beeper that sounds with each count detected. Other features include selectable alert levels, an adjustable timer, and an optional wipe test plate for swipes. 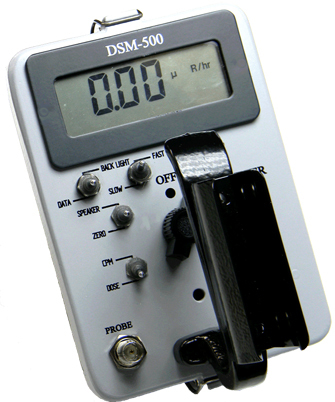 Internal memory and the Observer USB Software (free) allow the user to download data, set computer alarms, and calibrate the instrument. Detector: Internal Halogen-quenched, uncompensated GM tube with thin mica window, 1.4-2.0 mg/cm2 areal density. Effective diameter of window is 45 mm (1.77 in.). approx. 25%. Detects Gamma down to 10 KeV through the detector window. 3340 CPM/mR/hr (137Cs). Smallest detectable level for 125I is .02 µCi at contact. Selectable Alert Set Range: mR/hr .001 - 100 and CPM 1 - 350,000. Pulsating beeper sounds the alert. Adjustable alert levels are used for mR/hr / CPM, and µSv/hr / CPS. 70db @ 1m. Alarm will sound when in Timer Mode when set alarm threshold is reached. 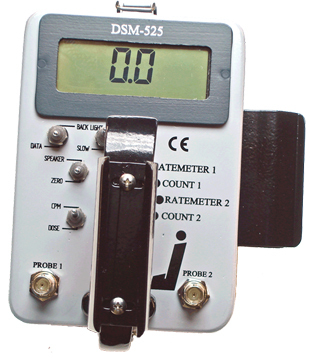 Anti-Saturation: Meter will hold at OVER RANGE in fields as high as 100 times the maximum reading. Averaging Periods: Display updates every 3 seconds. At low background levels, the update is the average for the past 30-second time period. The timed period for the average decreases as the radiation level increases.